Get Stolen cheaply from Amazon. You too can earn money from writing articles by signing up for InfoBarrel. 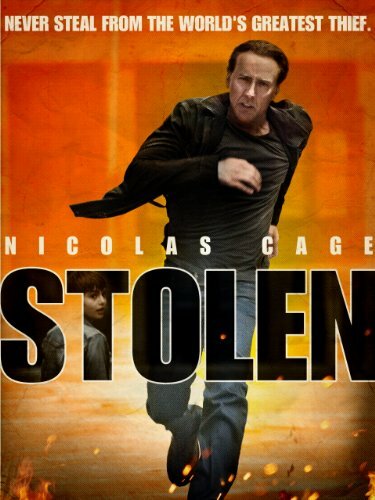 In Stolen, Will Montgomery (Nicholas Cage, Ghost Rider: Spirit of Vengeance, Season of the Witch) and his crew are master thieves, although Will seems to be the true brains behind the operation. They are in New Orleans robbing a bank, whilst FBI Special Agent Tim Harlend (Danny Huston, X-Men Origins: Wolverine), who has been after Montgomery and his crew for some time, and his team are lying in wait for them. Will and his partner Vincent (Josh Lucas) successfully break into the bank and steal $10 million in cash, which is when things start to go wrong. As they are leaving, Vincent accidentally shoots himself in the leg, and he and the others drive off, leaving Will behind and, after a chase, he is finally caught. Credit: https://en.wikipedia.org/wiki/Stolen_%282012_film%29#/media/File:Stolen_film_poster.jpgEight years go by as Will serves his time in prison, with his sentence lower than it could have been because he didn't have the stolen money on him. On his release, Will looks up his daughter Alison (Sami Gayle), who has now grown up and has now got some definite daddy issues. Their relationship is now definitely on the strained side. Alison is kidnapped by Will's former associate, Vincent, who lost a leg due to the bullet wound he suffered in the robbery and who everyone believed was dead. Vincent looks rather the worse for wear, and not just because of the missing leg; it looks like he has definitely gone downhill during Will's time inside. Vincent wants his share of the money that was stolen, or he will kill Alison. His share now seems to have increased to all of the money, rather than a portion of it. There is one real problem with this from Will's point of view - he doesn't actually have the money, as he burned it rather than be caught with it. Will tries to get help from Harlend, but the latter believes that he is lying and refuses to be played by him, leaving one other former colleague, Riley (Malin Åkerman), to help him commit another crime in order to raise the $10 million that is needed, only this time it's in gold, and he only has twelve hours to get the money or his daughter dies. This film is not quite as bad as would be believed by how poorly it performed at the cinema, but this is yet another comparatively poor film from Nicolas Cage, who doesn't seem to have been in a truly decent film in many years now. Compared to some of the films he's starred in recently, this is actually one of the better ones, yet Cage is still sleep-walking through the role. Truthfully, none of the cast really excel in their performances, and there are some decent actors in it - Cage is himself a good actor, but he seems to be choosing poor films to star in currently. Stolen is low-grade, fast paced and sometimes quite silly entertainment which keeps on ticking over at a reasonably decent pace, but in its favour, it never really tries to be anything else. I love reading movie reviews, as they help me decide which ones I should watch during my free time. I am also a fan of Nicolas Cage, but I don't think I will want to watch this one. Great review, however. Thanks! I do like Nicolas Cage, but his recent stuff hasn't been much good. Said to say, this is one of his better works over the past few years.